After years of planning, a herd of wild bison has been re-introduced to Banff National Park in Alberta. Conservationists say it’s an important first step that could influence similar efforts elsewhere. 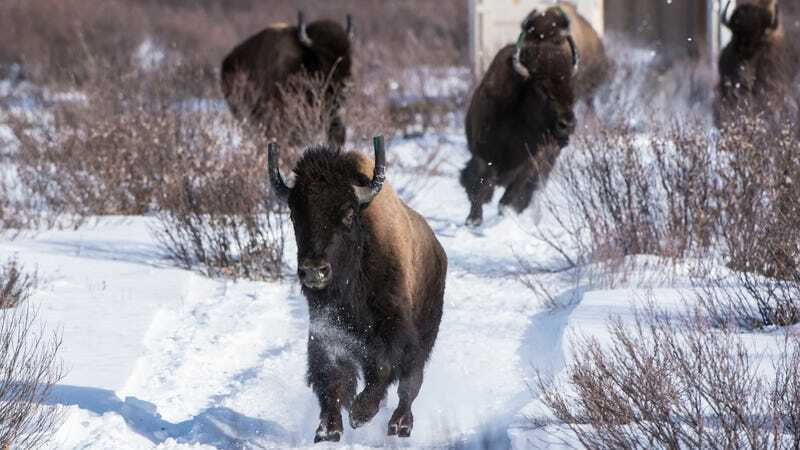 The 16 bison, which primarily include pregnant females, were loaded onto shipping containers in Elk Island National Park and transported to an enclosed pasture on the eastern slopes of Banff National Park. Officials say the transfer went smoothly and the bison are quickly adapting to their new digs. It’s the first time that bison have roamed this part of Canada in 140 years, having been nearly hunted out of existence in the 19th century. The creatures will be monitored carefully over the next 16 months by Parks Canada. Should all go well, the herd will be released into a 460-square-mile area where they’ll interact with other native species, forage for food, and re-integrate into the ecosystem. The ultimate goal is to re-establish a “thriving” wild population of bison in the national park, and then use the experience — and potentially the bisons themselves — to assist related conservation efforts in both Canada and internationally. The effort is being lauded by conservationists and local indigenous peoples. “This is a great day for Banff National Park. It’s a great day for Canada and frankly, it’s one of the great days for wildlife conservation in the history of North America,” Canadian conservationist Harvey Locke told the CBC.